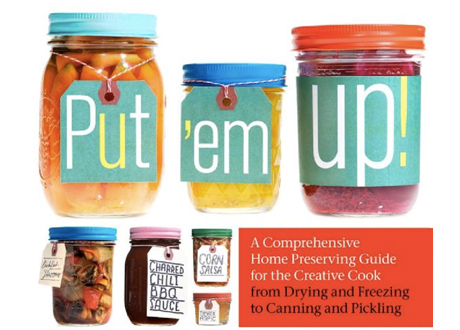 Not too long ago, like just around canning season, we received a book called Put ’em Up! by Sherri Brooks Vinton. Canning seems to have come into vogue again. This is a good thing. The other cool trend is that as these things come around again (butchery, gardening, canning, etc.) they are doing so with an eye to the 25 to 40 year old design-conscious—it’s not just cool again, it’s cool looking and fun. Makes it all relevant I suppose, and all the more appealing, which is totally the point. Enter my wife, author of Heavy Petal gardening blog and recently published author of Sugar Snaps and Strawberries, a guide to growing your own edibles. You see, when you create your own harvests you need to be able to use it all. And frankly, sometimes the yields are more than you can eat before they go bad. Canning, drying, and preserving are the ticket. A bumper crop of the nicest local strawberries this year was our starting point, but we also had plans for dried tomatoes, blueberry fruit leather (for the toddler) and a repeat of quince jelly (we actually made jelly, membrillo and liquor). So, guess who I gave the book to review? Andrea does a great job of it here. I’ll post more on my quince exploits shortly.